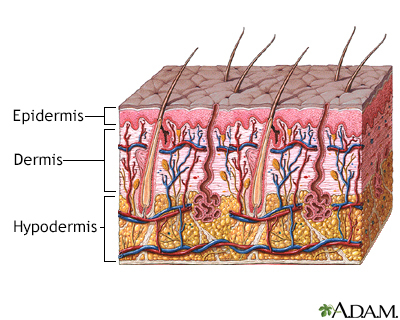 Sagging or wrinkled skin occurs naturally with increasing age. 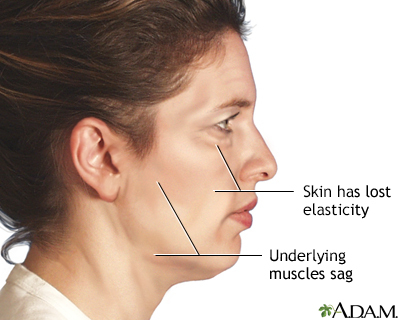 Folds and fat deposits appear around the neck, and deep flexion creases form between the nose and mouth. The jawline grows jowly and slack. Heredity, poor diet, smoking, or obesity may contribute to early or severe skin problems. A facelift can help repair some of the visible damage to skin, fat, and muscles and can restore a younger look. A facelift can be done alone or with nose reshaping, a forehead lift, or eyelid surgery. Most wrinkles come from aging changes in skin. Aging of the skin, hair and nails is a natural process. There is little you can do to slow the rate of skin aging, but many things in the environment will speed it up. Stay out of the sun as much as possible to limit skin wrinkles. Wear hats and clothing that protect your skin and use sunscreen daily. Avoid smoking and secondhand smoke. Wrinkles are not usually a cause for concern unless they occur at an early age. Talk to your health care provider if you think that your skin is getting wrinkled faster than normal for someone your age. You may need to see a skin specialist (dermatologist) or a plastic surgeon. Your provider will examine your skin. You may need a skin lesion biopsy if you have any abnormal growths or skin changes.